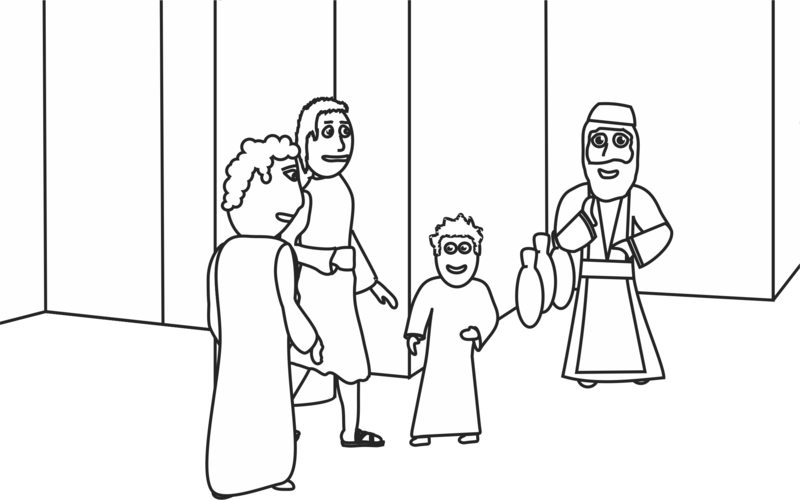 Every year Mary and Joseph made a trip to Jerusalem to celebrate Passover. When Jesus was 12 years old, it was no exception. After the celebrations were over, Mary and Joseph left Jerusalem to return to their home in Nazareth. They were traveling with family and friends, and they assumed that Jesus was there with the family. The group traveled for an entire day before Mary and Joseph started to look for Jesus. When they realized that he was not with their group, they returned to Jerusalem and began searching for Jesus. After 3 days they found the young boy in the temple, sitting among the teachers, listening and asking questions. When questioned about his behavior, Jesus told his parents that he had to be in the Father’s house. Jesus obediently returned to Nazareth with his parents where he grew in favor with both God and man. 1. Display the collage for all to see. Pass around the legend for everyone to take a close look at so they know who they will be looking for. 2. Explain to the children that Jesus and his family were traveling with many people. Mary and Joseph did not know that Jesus was not with them. Tell the children that they will help look for Jesus, as well as some of his family members who may have been traveling with them. 3. Ask the children how they think Mary and Joseph must have felt when they were not able to find Jesus right away. How would they feel if they got separated from their mom and dad? Where is a safe place they can go if they get separated from their mom and dad? And Jesus grew in wisdom and stature, in favor with God and man. *Use this game if you have the space available, or if you can be in a contained, outside environment. 1. Choose one person to be it. 2. The person who is it has to close their eyes and count to 20. 3. All other students must hide themselves while the it person is counting. 4. The person who is it must search out all the other students until they are all found. 3. Allow the children to work together, or to race against each other in order to find Jesus. 1. Explain to the children that people in Jesus time read their bible from scrolls. Today you will be making scrolls. 2. Give each child a half sheet of white paper that has been cut in half the long way. 3. Using colors, allow each child to write the memory verse on the paper, and draw any addition decorations they choose. 4. If the children are older, you can give them the suggestion to tear the edges of the paper and crumble it up to give it a more old look. 5. Give each child two popsicle sticks to glue to the short sides of their paper. 6. Roll up the scroll from both ends at the same time, until the popsicle sticks meet in the center. 7. Hold the scroll together using a rubber band.